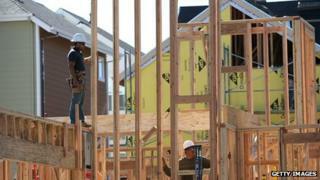 The rate of new US home-building rose in July, spurred on by a rise in the construction of new apartments. The Commerce Department said new-home construction climbed by 5.9% from the prior month. The annual rate was 896,000 new homes, below a recent peak of just over 1 million in March. The rate of new single-family houses being built dropped by 2.2% - a sign that builders could be worried about rising mortgage rates. Permits to build new homes rose 2.7% but missed analysts' expectations. The rate for a 30-year mortgage was 4.4% in July - a full percentage point higher than it had been in May, before the US Federal Reserve started hinting that it might begin to slow down its extraordinary efforts to prop up the US economy. A spate of mixed economic data since then - including news that the US economy grew by 1.7% in the second quarter - has tempered fears of an end to stimulus. In a separate report, US workers continue to grow more productive although the rate of productivity growth has slowed since 2009. Productivity grew by 0.9% in the second quarter from the same period last year. Labour costs rose by 1.4%, reversing a drop of 4.2% in the prior quarter. If productivity slows significantly, US companies might be forced to bring on more workers to make up for the slack. Productivity growth has averaged 2% a year since 1947, although it has slowed in recent years.